Let me start by saying that this post is more like the beginnings of an exploration rather than something I am trying to draw conclusions with. My interests are the historical role that the government has played in funding research and development in the United States, the scale of those programs relative to overall government expenditures, and the potential for additional funding sources to complement and enhance funding for R&D in the future. I'm just trying to document these explorations a little. The data in the post comes from the OMB Historical budget tables, specifically Table 9.7 (xls) and Table 9.8 (xls). The first chart shows the fraction of US government outlays (i.e. spending) that went to defense and non-defense research and development. The 1960s peak coincides with the Cold War Space Race that culminated with the Apollo program moon landing, a feat not repeated by humanity for 39 years now (not that China isn't working toward this goal as we speak). Both defense and non-defense spending have flattened out since then as a fraction of outlays. The next chart breaks out funding for three Federal research agencies that operate in the non-defense category. The value is again expressed as a fraction of total Federal outlays. Anyone who has spent time in the academic world knows how critical grants from institutions like the NSF, NASA and NIH are to funding day-to-day research operations. 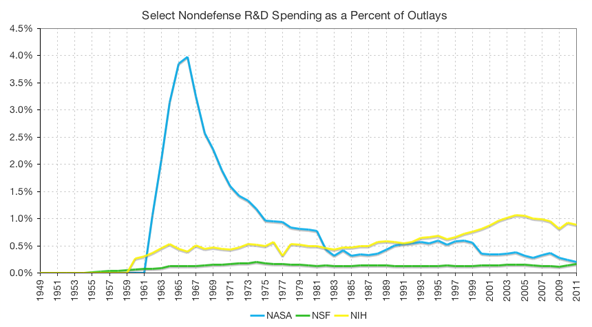 But perhaps looking at R&D spending as a fraction of total government spending is a bit misleading. As the country has developed over the last 60 years, we've instituted new programs and created new agencies which have increased our total expenditures. In reality R&D spending has been growing; it just hasn't been growing as fast as many other components of government spending. 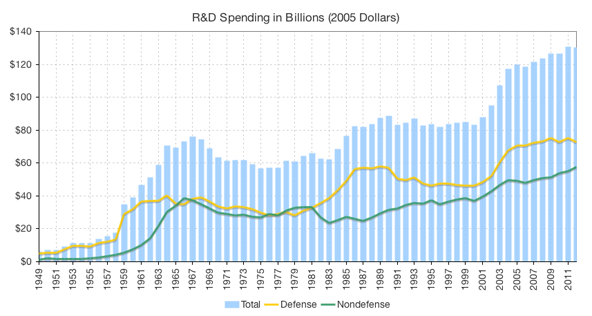 The next chart shows the R&D spending in 2005 constant (i.e. real, inflation adjusted) dollars. 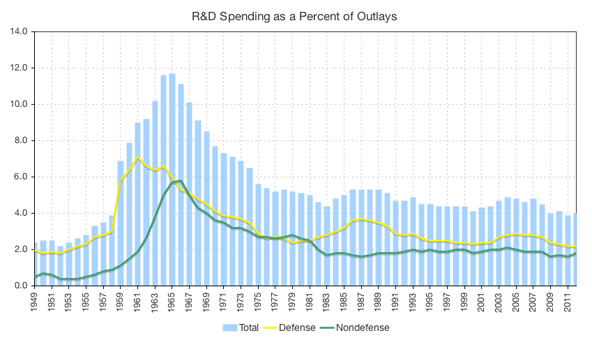 Indeed, non-defense R&D spending was 40% higher in 2011 than 2001 on a real basis, but dipped slightly over the same period when expressed in terms of total government spending. So we continue to spend more and more money on research, it's just that we spend even more on other parts of government. My real interest here isn't to critique the amounts we've been spending but instead goes back to that idea that Tyler Cowen put forth in the Great Stagnation, that is, to "raise the social status of scientists." Admittedly, status goes beyond financial considerations and includes a significant cultural component, but these (and other) research agencies help confer status to US scientists to the extent we define status as funding and employment within the scientist's field of expertise. We haven't done a bad job of things so far, but what could we accomplish if we were to increase funding to these agencies? What might we have already accomplished had that increase started 10, 15 or 20 years back? Can we reasonably expect that spending more in this category would yield positive results over the long term? Would it help foster a cultural appreciation of science and scientists? With the sluggish economy and political deadlock in Washington, I doubt that we'll see significant increases in funding going to research and development organizations in the coming years — at least not from the Federal government. But I wonder if there isn't a way to leverage the institutions that we've already created. Can we build public/private partnerships that channel additional financial resources into the agencies we've already built? If so, would this be a wise thing to do?